While Iris and one set of her grandparents are Deaf, her parents are not, and her father doesn't even make the effort to learn sign language. Iris has an interest in repairing older radios, and this gives her a nice past time and source of income. School is a struggle, and it's hard to deal with some of her fellow classmates, especially one who pretends to know ASL but just annoys Iris with her unsuccessful and self-serving attempts. 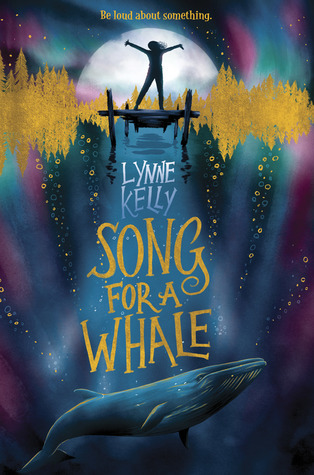 When Iris' science class learns about Blue 55, a whale who communicates on a frequency that no other whales do, and so leads a lonely existence, she is drawn to his story and tries to help. She consults with the music teacher and creates a sound track on the frequency the whale uses, and contacts a research station in Alaska to see if they can use it. When the scientists there invite her to come by if she is ever in the area, Iris decides she really needs to go to help out. Her parents, wisely, say no, so she approaches her grandmother. Her grandmother is not doing well after the passing of her spouse, and decides a cruise to Alaska is just what she needs. The two sneak off on their adventure, and while Iris is not able to help Blue 55, she is able to put some things in her life into perspective and to speak up for herself. Strengths: The author's background working with Deaf students is apparent, and the details about having an interpreter at school, dealing with classmates, and of feeling the vibrations through the radios are all good details for hearing students to have. The science connection is interesting, and the relationship with the grandmother is charming. The father's difficulty in connecting with Iris adds a layer of realistic depth. Weaknesses: There have been several Deaf students at my school, and none of them were ever treated this badly. I had one girl with an interpreter and a cochlear implant who was even a library helper for several quarters-- we just made sure students knew to make sure she could see their face and to talk clearly but normally when they checked out books so that she could understand them, and she never seemed as isolated and unhappy as Iris. Doesn't make for as good a story, but makes me feel good about my students! What I really think: There should be more books than Ferris' Of Sound Mind and Gino's You Don't Know Everything, Jilly P! that include Deaf culture, so I am really glad to see this one.